Parkinson’s Disease (PD) has a wide range of symptoms that generally begin with tremor, stiffness, and slowing of movement. As the disease progresses, PD motor symptoms can include foot-dragging, freezing, less-pronounced movements, and facial expression. Treating Parkinson’s with physical therapy is recommended to reduce stiffness and discomfort and to allow patients to continue to perform daily tasks and retain independence. Parkinson’s physical therapy should be the first medicine in the treatment of PD. Properly trained physical therapists (PTs) can address issues beyond just the condition’s motor symptoms. Specific exercises targeting PD can have a large impact, and PD experts agree that physical activity is beneficial to PD patients at all stages of their disease, including at early diagnosis. Physical therapists trained in treating neurological conditions recommend exercises for people with PD aimed at improved balance and coordination, flexibility, endurance, and strength. Researchers have found that during Parkinson’s physical therapy, the frequency of a workout is more important than the type of exercise a patient engages in. In fact, patients who exercise at least 2-1/2 hours per week experience a slower decline in quality of life. Each person with PD is affected differently, and specialists in Parkinson’s treatments should take an individualized approach to managing the disorder. Read on for our Physical Therapy for PD Q & A. There are two different types of symptoms of PD: Motor symptoms which have to do with movement, and nonmotor which do not. Nonmotor symptoms, such as sleep problems, loss of sense of smell, anxiety, depression, apathy, and lightheadedness when standing up, can develop well before any motor symptoms are present. Motor symptoms are known to begin around the age of 60. Currently, there is no known way to prevent or reverse Parkinson’s disease. Studies have shown that treating Parkinson’s Disease physical therapy has led to improvements in movement and fitness. Those improvements, however, have only been seen to last as long as the individuals keep up their exercise routines. Physical therapists partner with people with PD and their families to manage their symptoms, maintain their fitness levels, and help them stay as active as possible. A physical therapist will teach exercises to strengthen muscles and help compensate for the changes brought onto your body by PD. Your physical therapist will treat you differently than other patients with PD. Since PD affects every patient differently, your PT will conduct an evaluation to test your fitness, strength, coordination and more and develop an individualized exercise plan that you will be able to do on your own. The Michael J. Fox Foundation for Parkinson’s Research provides tips for how to get the most out of your physical therapy for Parkinson’s. How does Exercise Affect the Brain in PD? Exercise has been shown to have a neuroprotective effect on the brain. Researchers have demonstrated that exercise enhances the release of protective Brain Derived Neurotrophic Factors (BDNF) and increases brain plasticity, the ability of the brain to reorganize and form new connections between neurons to compensate for injury and disease. Studies show exercises incorporating goal-based training and aerobic activity improve blood flow and facilitation of neuroplasticity in elderly people and improve motor function in PD. Dopamine is the neurotransmitter, or nerve cell, that communicates movement to the brain. Researchers studying the effect of exercise on the brain in PD have found that, while exercise does not increase the production of dopamine, it does help the body use dopamine more efficiently and also may reduce damage to the neurons that produce dopamine. Physical therapists, whether at a hospital or a wellness center, can teach restorative and compensatory strategies that help to compensate for the changes your body is undergoing due to this disability. These include learning new movement techniques, such as taking two steps backward before turning down a hallway to prevent freezing, practicing how to get in and out of a chair, and fall prevention. Amplitude training, which uses high steps, large arm swings, and other exaggerated movements, fights the progression of hypokinesia due to muscle rigidity, which results in small, shuffling movements. All physical therapists are educated on performing balance training and what PD is; however advanced training is needed to give proper care when administering Parkinsons’s physical therapy. Some physical therapists have a neurological focus or have completed a residency in neurological physical therapy. These therapists have advanced experience and knowledge in your condition and may prove to be a better fit for you. 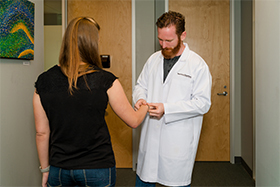 Neurology Solutions’ physical therapy clinic Austin Renewal Therapy is led by a doctor of Physical Therapy who is a certified Parkinson’s Wellness Recovery (PWR) therapist specialized in the Parkinson’s population. The American Physical Therapy Association (APTA) offers a directory to find a PT anywhere in the United States. If possible, it is best to see a physical therapist who has experience treating people with Parkinson’s. Make sure to ask about past experience helping patients with PD when contacting a physical therapy clinic. How Many Physical Therapy Visits Will I Need? Learning techniques to begin treating PD with physical therapy typically requires several 30- to 60-minute sessions at the outset. The first meeting serves as an evaluation and includes recommended exercises. The following few appointments are used to check your progress and make any adjustments to your home exercise program if necessary. What Other Services Do Physical Therapist Provide? Patients will receive functional capacity evaluations from their physical therapist. These evaluations help provide information for disability claims based on physical performance, such as not being able to work an eight-hour day. A physical therapist can also recommend outpatient or rehabilitation facilities and direct you to other exercise programs in your community. They can also suggest complementary therapies, such as boxing, dancing or yoga. Yoga has been shown to positively impact areas of the brain affected by PD as well as improve posture, mobility, and sleep. Neurology Solutions offers a Neuroscience blog designed to educate patients and the community at large on various areas of metabolism and promote longer and better quality of life for individuals with neurodegenerative disorders. Stay informed by frequenting Neurology Solutions’ blog and follow Neurology Solutions’ Youtube page to be notified of educational videos on lifestyle and treatment options for movement disorders. Join Neurology Solutions Movement Disorders Center’s email list to stay up to date on the latest in treatment and how to manage stress, stay healthy and maintain quality of life while living with a movement disorder. Our health and wellness clinic is accepting new patients seeking a specialist in treating Parkinson’s disease, dystonia, essential tremor and age-related disorders affecting movement. If you would like to schedule a movement disorder specialist consultation, please contact Neurology Solutions by email or call 512-865-6310 to schedule an appointment.